With 843 deaths in just a few hours, Passchendaele has become a byword for the horror of the First World War. Historian Ian McGibbon explains how he determined the number of men who actually lost their lives as a result of the attack on 12 October 1917. In terms of lives lost in a single day, 12 October 1917 ranks as the most catastrophic in the country’s post-1840 history. On that day the New Zealand Division assaulted Bellevue Spur at Passchendaele, in Belgium. The second of two attacks made by New Zealand troops during the Third Battle of Ypres, it was a disastrous fiasco. During the First World War determining exact casualty figures, especially those occurring in major battles, was usually very difficult. Unit war diarists often had no knowledge of the fate of men who went forward during attacks but did not answer roll calls afterwards. Men listed as missing were sometimes being treated in medical facilities, which were not necessarily New Zealand ambulance units. Once men were evacuated from the front, units had little knowledge of their disposition. In those pre-internet days keeping track of particular men once they left their unit was always problematical. For these reasons casualty figures given in war diaries are often inaccurate, and this was reflected in histories written soon after the conflict. In his official history The New Zealand Division 1916–1919 (1921), Hugh Stewart gives a figure of 640 dead (among 2,700 casualties). A.D. Carbery, in The New Zealand Medical Service in the Great War 1914–1918 (1924), gave estimated figures that were nearer the truth for fatalities on 12 October, if we accept that most of the missing were in fact dead: 504 killed, 327 missing and 1,904 wounded among the two brigades engaged on 12–13 October 1917. An advanced dressing station in the Ypres Salient, one week after the offensive at Passchendaele. 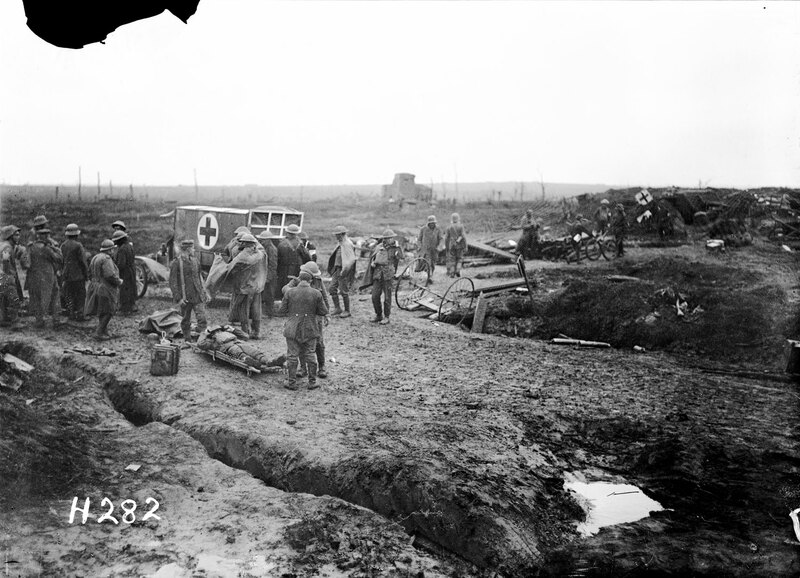 Scene includes soldiers gathered around an ambulance and a wounded soldier laying on a stretcher on the muddy ground. Image courtesy of Alexander Turnbull Library, Ref: 1/2-012928-G.
How to determine the number of men who actually lost their lives as a result of the attack on 12 October? 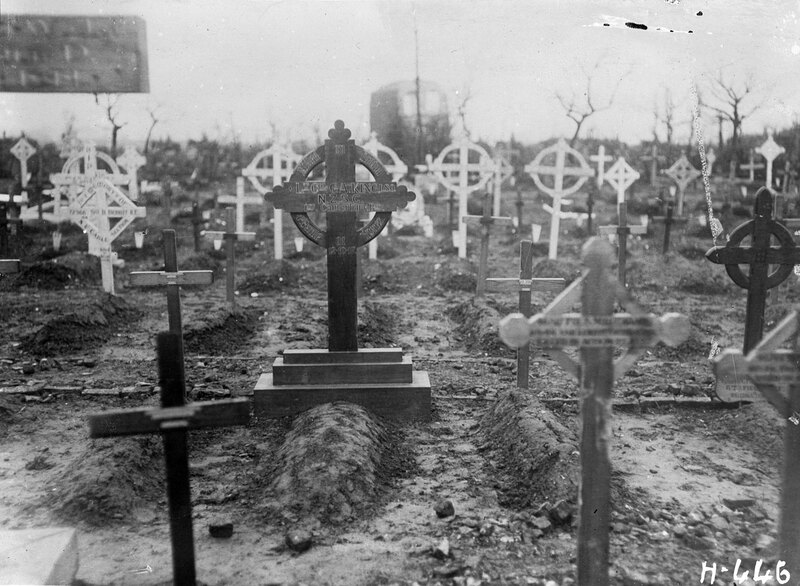 The Commonwealth War Graves Commission’s website indicates that there are 847 New Zealand men buried or commemorated in France and Belgium with a death date of 12 October 1917. The only man commemorated in France was wounded on 4 October. Analysis of a list of men who died of wounds in Belgium from 12 October to 12 November supplied by the CWGC indicated that three men with death dates of 12 October had been wounded on either 4 or 10 October. This leaves a figure of 843 for those who died on 12 October as a result of the attack. Most were from the 2nd New Zealand Infantry Brigade (449) and the 3rd New Zealand (Rifle) Brigade (342). Of the 843, many would have been killed outright or succumbed quite quickly to their wounds. But there would have been many who lingered on in the muddy shell holes. Because of the quagmire it was a monumental task to retrieve wounded men from the battlefield. Some were no doubt never located. It is likely that a proportion of these men were still alive as dawn broke on the 13th, forlornly awaiting rescue. So the figure of 843 for 12 October probably includes men who actually died the following day –or even on the 14th. Their official date of death is, however, the day they went missing. Soldiers of 3rd Battalion, New Zealand Rifle Brigade, in muddy conditions at "Clapham Junction", Belgium, circa 20 November 1917. Shows one reading jokes from the publication "NZ at the Front" to a wounded man on a stretcher. Image courtesy of Alexander Turnbull Library, Ref: 1/2-012979-G. Many of the 1,860 wounded were grievously injured and did not recover. During the first month after 12 October, 110 men died of their wounds. In the case of two soldiers, it was not possible to determine from their service records when they were wounded. To determine those who died of 12 October wounds in the two months after 12 November, I first used the CWGC website to ascertain that 861 men are buried or commemorated in Belgium, France and the United Kingdom with death dates during that time. Because the website merely states that men died, I had to look at each of those soldiers’ personal files. This was possible because all the NZEF personal files are now digitised and available on the website of Archives New Zealand. Downloading and inspecting these files was necessarily a time consuming task, but the result is an authoritative figure. Four men died of 12 October wounds during those months. The grave of Lieutenant Colonel George A. King, DSO, killed at Passchendaele on 12 October 1917. Image courtesy of Alexander Turnbull Library, Ref: 1/2-013067-G. In all, I identified 114 men who succumbed to wounds they incurred on 12 October in the ensuing three months. The most authoritative figure for fatalities as a result of the 12 October attack is, therefore, 957 — about 50 per cent more than Stewart’s in his official history. Even this is not the full figure, however. A few more men no doubt died of their wounds after 12 January 1918, some lingering on even for years before doing so. With nearly 500 dead or dying from the 4 October 1917 attack, and others killed while holding the line between and after the attacks, New Zealand’s dead in the Third Battle of Ypres approached 2,000. There are 1,796 NZEF men buried or commemorated in Belgium in October 1917. Most of the 109 men who were buried or commemorated in France in that month were also victims of the battle. 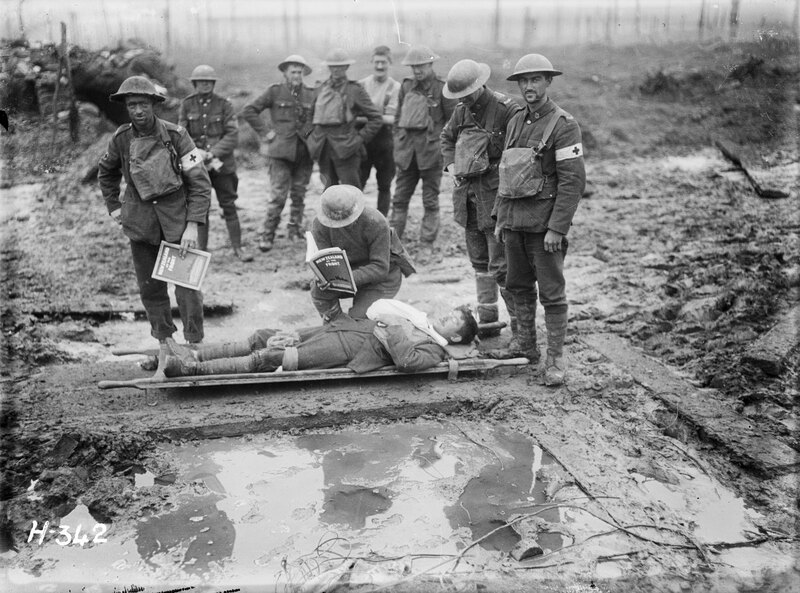 In terms of overall losses New Zealand involvement in the Passchendaele battle was slightly less costly than its sacrifice in the Battle of the Somme during the previous year, when at least 2,100 men were lost.